A week of snow, of broken routines and sledding before sunrise. Of early nights, and being surprised that I’m hooked by the space western Firefly. 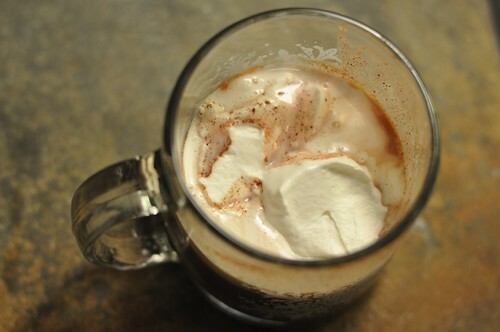 Drinking The Duke’s Hot Chocolate with pepper and all spice, as snowmen infiltrate the backyard. Learning to identify the Bewick’s wren, black-capped chickadee, gray-headed junco, and red-shafted flicker at the bird feeders. Wishing I could do this. I LOVE Firefly – great show! Glad you guys are enjoying the snow. 🙂 That Hot Chocolate looks amazing. At first I read “Learning to identify with Bewick’s wren…” and now I’m wondering what it would mean to identify with a songbird. 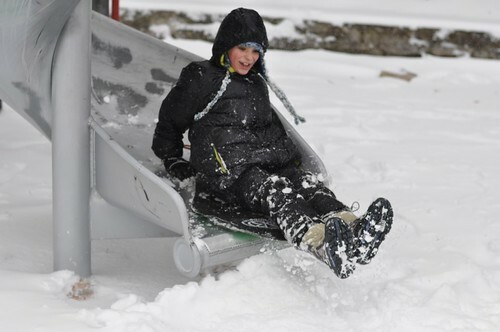 Love the boy in swim trunks and boots in the snow. The bird-man picture scares me. I love that pile of beautiful quilts (plus beautiful child). 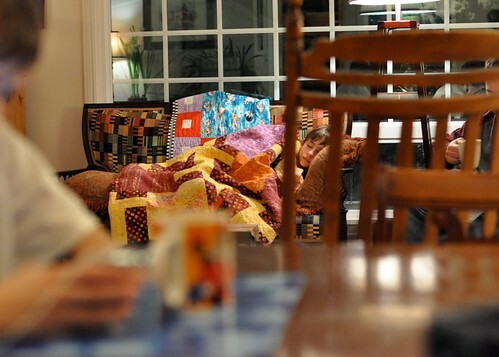 Is your couch draped with a quilt, or is it actually upholstered in quilt? Wow, that’s a lot of snow. I’m jealous! What a wonderful day! No wonder he was tired. Andrea, the couch is upholstered with fabric that is similar to a quilt. It reminds me of Klimt.